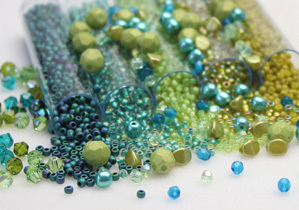 Hello Beading Friends, welcome back to another blog from Eureka Crystal Beads! >>> It’s an amazing way to re-experience classic bead stitches (like Peyote, Herringbone, etc.) with Czech glass 2-hole beads rather than single-hole glass seed beads. It’s like re-learning a beloved stitch all over again and that’s oh-so-fun! Want to see what I’m talking about? Check out my video tutorials on the Eureka Crystal Beads YouTube page! Czech Glass 2-hole Superduo beads work so well for many of these stitches! >>> There are just SO many amazing patterns out there with these fun multi-hole glass beads! They are being utilized to create such dimensional pieces of jewelry and even being used to encase Swarovski Crystal stones (Fancy stones, Rivolis, Chatons, etc.) in new and exciting ways! The first pictured here are the Czech glass 2-hole AMOS PAR PUCA beads. These are 5x8mm in size. I love how sleek and precise these beads are! Next are the incredibly versatile Czech glass 2-hole SUPERDUO beads. These are so much fun to work with! They measure 2x5mm. We also carry a beautiful collection of exclusive SuperDuo mixes as well! Lastly pictured at the very fun Czech glass 2-hole SILKY beads. I recently created an earring pattern using Silky beads along with Swarovski Crystal Chatons – so if you’re looking for a good idea for what to make with them, head on over to the Eureka Crystal Beads YouTube channel for that video tutorial! Speaking of patterns…Eureka Crystal Beads currently offers many exciting beading patterns (lots of totally FREE PATTERNS as well!) in all different skill-levels using these fun beads. And, we have a lot more coming soon on the horizon with regard to amazing NEW patterns that we’ll be featuring! Until next time, Keep Beading!! Previous Post Jewelry Design Ideas: Bead Caps! How about Super8’s or ZoliDuos? I’d love to see some interesting new bracelets designed with both. Or multiple 2-hole beads in one bracelet. The Es-O Minis are loads of fun. I’ve been trying some of the brand new beads, as they have come out, over the last couple of years – they just get better and better! The Ava’s are also lots of fun, and I’ve heard a rumour, there is a Mini Ava – different name (which I’ve forgotten), but still in the classic “V” shape. Things are definitely heating up in the bead world, not a time to be sitting on the sidelines, as the jewellery is now hitting main stream. More and more entertainers are choosing to wear these gorgeous creations!